Philadelphia has a large and comprehensive transportation system that allows residents and visitors to travel from one part of the city to another in a smooth and efficient manner. The foundation of this transportation system is the subway with three lines operated by SEPTA, and an additional line operated by PACTO. SEPTA’s lines operate from 5:00 am to 1:00 am. A ticket costs $2.50 if you pay in cash or $2.00 if you use the tokens that can be purchased by the pack at any station and in over 400 different locations. The PACTO line operates 24 hours a day and its price varies depending on the distance traveled, ranging from $1.40 to $3.00. These 4 lines work together with a system of buses, trains, and trolleys to provide transportation to any part of the city. In April of 1903, the first construction of a tunnel from City Hall to 23rd Street began, followed in 1904 by the construction of an elevated section on Market Street. Opening in March of 1907, this would become Philadelphia’s first subway line and what we know today as the Market Frankford Line. Initially, it only went from 69th Street to City Hall. In the same year that the first line was opened, the Norristown Line also began to operate. It was then known as the Philadelphia and Western Railroad and its route began on 69th street ending in Strafford, Pennsylvania. Several extensions were made over the years that resulted in what we now know as the Norristown Line. Twenty one years after the opening of the Market-Frankford Line, the northern half of the Broad Street Line began to operate. This line was extended several times until 1973, when it reached Pattison Avenue and completed what is known today as the Broad Street Line. These three lines are operated daily by SEPTA which was created in 1963 after absorbing the two agencies that were previously in charge of transportation: the Passenger Service Improvement Corporation (PSIC) and Southeastern Pennsylvania Transportation Compact (SEPACT). SEPTA is currently in charge of most of Philadelphia’s transportation, including not only the main subway lines, but also a large number of bus routes, trains and trolley lines. In addition to SEPTA, the company PACTO is in charge of a small portion of Philadelphia’s transportation. PACTO’s current system was constructed modeling routes that date back to the nineteenth century. This route was transformed and extended several times until 1969 when it became what is known today as the PACTO Line. Philadelphia’s current subway is the foundation of the city’s transportation system. It is the most used mode of transportation by residents and visitors, making it the sixth most used subway system in the United States. Philadelphia has 3 subway lines operated by SEPTA (Southeastern Pennsylvania Transportation Authority), the same company that is in charge of most of the city’s buses, trolleys and trains. An additional subway line is operated by the company PACTO. Also known as the blue line, this line has 28 stations along its route that begins downtown at 69th Street Transportation Center, passes below Market Street and ends at the Frankford Transportation Center. Its route of approximately 13 miles (21 kilometers) include below ground sections as well as surface ones and it is the most used line by Philadelphia’s residents. Frequency: Every 6 minutes during the week at non-peak hours, every 4 minutes during the week at peak hours and every 10 minutes on weekends. Overnight replacement bus: An overnight bus (named the Market-Frankford Owl bus) runs Sunday to Thursday, making the same stops as the subway. This line runs 24 hours on Fridays and Saturdays. Also known as the orange line, this line has 25 stations that pass through Philadelphia from north to south, from the Fern Rock Transportation Center to the AT&T Station. It has a length of approximately 12.4 mi (20 kilometers) that mainly runs below ground. It was given its name because Broad Street can be found running below most of its route. This is the line that Philadelphians take south of the city to the stadiums and arenas for sporting events. Local (L): Stops at every station. Express (E): Only stops at designated stations. Broad-Ridge Spur (R): Runs along Ridge Avenue to 8th and Market Street Monday through Friday. Special (S): When there are sporting events and shows, this service leaves from express stations and travels directly to the AT&T Station. Overnight replacement bus: An overnight bus (named the Broad Street Owl bus) runs Sunday to Thursday, making the same stops as the subway. This line runs 24 hours on Fridays and Saturdays. Also known as the purple line, this high speed line connects Philadelphia with Norristown. It has 22 stations from the 69th Street Transportation Center to the Norristown Transportation Center. Unlike other subways, passengers on the purple line need to signal their stop by pressing a button just as they have to signal from the station to be able to board. There are various express services that only stop at designated stops reducing the travel time it takes to reach Norristown. Overnight replacement bus: There is no overnight replacement bus. This is the only line operated by the Port Authority Transit Corporation. It includes a high speed service that connects Philadelphia with Camden County in New Jersey. It has 13 stations that run from east to west beginning at 15-16th and Locust station in Philadelphia and ending in Lindenwold station in New Jersey. Similar to the Market-Frankford Line, part of the route is surface and part of it is below ground. This line offers local routes and express routes that only stop at designated stations. Overnight bus replacement: The PACTO line runs 24 horas. 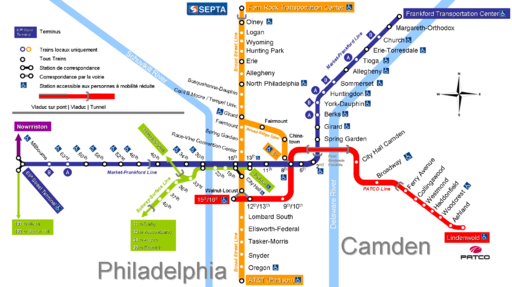 Philadelphia’s three subway lines, operated by SEPTA, run from 5:00 am to 1:00 am. The frequency of available subways depend on the line and if it is peak or non-peak hours. The PACTO line runs 24 hours a day. Market- Frankford: The Market-Frankford line runs every 6 minutes from Monday to Friday during off-peak hours and every 4 minutes during peak hours. It runs every 10 minutes on weekends. There is an overnight bus that makes the same stops as the subway during the hours when the subway is not operating. This bus runs every 15 minutes from Sunday to Thursday. The subway runs 24 hours on Fridays and Saturdays with service every 20 minutes. Broad Street: The local service runs all day, every 8 minutes Monday to Friday and every 10-12 minutes on weekends. Similar to Market-Frankford Line, this line runs 24 hours on Fridays and Saturdays with service every 20 minutes. The overnight bus that replaces the subway from Monday to Friday runs every 15 minutes. Norristown: The subway runs every 15 minutes on this line. During the week at peak hours (6:00 am -9:00 am, 2:15 pm -6:45 pm) there is express service to designated stops only, reducing the trip time to Norristown. PACTO Line: The PACTO Line is open 24 hours with service every 10-15 minutes during the week and service every 20-30 minutes on weekends. A free connection can be made from the Market-Frankford subway to the trolley line known as Subway-Surface at the following stations: 30th, 15th and 13th. A free connection can be made from the Market-Frankford line to the Broad Street Line at 15th Station. A free connection can be made from the Market-Frankford line to the PACTO line at 8th & Market station. This connection is not free. This line’s Broad-Ridge Spur service allows a connection to be made with the Market-Frankford Line and the PACTO Line at 8th & Market station. A free connection can be made from the Subway-Surface trolley and the 15th Street station through City Hall station. A connection can be made to the PACTO Line at Walnut-Locust station. This connection is not free. The only possible connection from this line is to the Market-Frankford Line is at 69th Street Transportation Center station. *There are no free connections from this line to any of the SEPTA lines. A connection can me made through the Broad Street Line tunnel at 12-13th & Locust station. A connection can be made to Market-Frankford Line at 8th and Market station. *Children, age 4 and under and adults, age 65 and older always ride free. Cash and tokens: A trip paid in cash costs $2.50 and must be paid in the exact amount since neither operators nor cashiers can give change. This payment method for a subway trip costs the most. Tokens are the most economical payment method. Each token cost $2.00 and is sold in packs of 2, 5, and 10. They can be purchased at any station, online, and on machines at 400 different locations spread throughout the city. Transfers: It is necessary to purchase a transfer when the trip includes more than one transit service (subway, bus, trolley, etc.). Only transfers in the same direction of travel can be purchased. Each transfer cost $1.00. Free transfers can be made between the subway lines and the trolley line at designated stations. Passes: SEPTA offers weekly and monthly passes called TransPass that can be used on any SEPTA operated service (buses, trolleys, and subways) during the designated time. A weekly pass costs $25.50 and has a 56 trip limit to be used within one week (from Monday to Monday). The monthly pass, valued at $96.00, has a 240 trip limit that can be used from the first day of the month to the first day of the following month. Additionally, SEPTA offers a one day pass called the “One-Day Independence Pass that offers unlimited day trips on all SEPTA services including regional trains. An individual pass costs $13.00, while the family pass including up to five people costs $30.00. It is also possible to purchase a one day pass called the “One-Day Convenience Pass” that includes 8 bus, trolley or subway trips for $9.00. The price of a trip on the PACTO Line depends on the distance traveled. Prices range from $1.40 per trip between two stations within Philadelphia up to $3.00 for a trip across the entire line. All passengers must pay the appropriate fare to the conductor, operator or cashier to obtain service. Weapons, sharp objects, corrosive materials or any other object or material that places the security of passengers at risk are prohibited. Adults are responsible for the safety of children in their care. Watch your personal belongings and make sure you don’t leave anything on the subway. Stay behind the yellow line while waiting for the subway. Most regional trains offer parking similar to that at Fern Rock, 69th Street Terminal, Frankford Transportation Center and Norristown Transportation Center. Free transfers can be made between metro lines and the trolley line at 30th Street, 15th Street/City Hall and 13th Street stations. The SEPTA and PACTO websites offer maps and tools to plan your trip before you leave. SEPTA and PACTO apps can also be downloaded to plan your trip before you leave. Children, age 4 and under and adults, age 65 or older always ride free. Transfers can only be made in the same direction of travel. The TransPass passes don’t include regional train trips with the exception of the line that goes to the airport. The Philadelphia subway was inaugurated in 1907, making it the third oldest metro system in the United States. The Philadelphia subway system is the sixth most used system in the United States. Extension of the Market-Frankford Line to Roosevelt Boulevard and Bustleton Avenue. Extension of the Broad Street Line along Roosevelt Boulevard to Pennypack Circle. This line would connect it to the Market-Frankford Line on Roosevelt Boulevard. Although the proposal has not yet been accepted, the idea of extending the Broad Street Line to the Naval Yard has received a lot of support and is currently in discussions. Philadelphia’s subway lines do not connect to the airport but it is possible to use the Market-Frankford Line to arrive at 30th Street station, where a regional train can be taken to all airport terminals. Independence National Historical Park / Independence Hall: Market-Frankford Line’s 5th Street station takes you to the site where the United States Declaration of Independence was signed. Independence Hall is part of Independence National Historical Park, one of the 22 world heritage sites protected by UNESCO. Monuments and sites related to the founding of the United States and the Revolution of the Thirteen Colonies can be found here. Liberty Bell: The famous Liberty Bell, one of the most important symbols of the War of Independence, can also be admired in Independence National Historical Park. Edgar Allan Poe’s House: The preserved house that Edgar Allan Poe once rented is a 15 minute walk from the Spring Garden station on the Market-Frankford Line. Rodin Museum/Barnes Foundation: The Rodin Museum can be found a 15 minute walk from Spring Garden station on the Broad Street Line. Outside of France, it contains most of Rodin’s works. Also close by is the Barnes Foundation, a museum that contain items and collected works by artists such as Renoir, Cézanne, Matisse, Picasso y Van Gogh. South Philadelphia Sports Complex: Broad Street Line’s AT&T Station runs to the South Philadelphia Sports Complex. Including the Wells Fargo Center, Lincoln Financial Field, Citizens Bank Park and Xfinity Live!, it is a combination of arenas and stadiums where all Philadelphia’s major sporting events are held.